Well the training program is in full swing, and boy can I feel it. Last week was my yearly visit to Boulder Colorado for the Bolder Boulder. This was my 5th race. 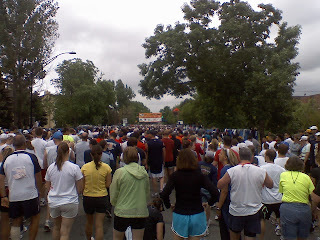 It still amazes me to see that many runners and walkers in the same place. This year was no different with over 53,000 runners. Where are all these people when I need someone to run with? I ran the race with my 11y/o grandson. He really ran a great race. For 11 y/o he pushed hard and we kept up a pace of 8:57min/mi. finishing in just over 55:30. For once it was a cool day to run, well---maybe too cool and rainy at the end. We were unable to enjoy the Expo afterwards. All in all, it was a great race as usual - if you have never done the Bolder Boulder then plan on it for next year. It's a fun day for all, runners, walkers and bystanders. My swim training is progressing nicely. I am pushing total workouts of around 2600 yards. My aerobic sessions are now in the 2000's. I am still and always working on form more than speed. i feel the the better my form is the faster I will become. I have not had any open water practices yet but I am working on putting a few together. My cycling is going OK also. I have had no trouble on the bike this year so far. Just a few flats but nothing else. This weekend I am suppose to do a long ride of 3 hours. I hope the weather holds or it will make for a sloppy ride. Tonight I am riding with the Canon City Cycling Group - They usually have a great turnout and ride pretty aggressively. I usually push myself faster and harder with the group then when I ride alone. I did notice that is is time to buy tires again. Seems like I am always buying something for this sport. My running is going fine - I guess. I am not progressing at the rate I should be. I still feel slow - and long distances are a struggle. I am trying to push harder but I still feel clumsy and slow when I run. Thinking about running a marathon after a bike ride is still worrying me. But with perseverance over the next 3 months I hope to make up for it. I know that the Ironman will be hard and torturous - I just don't want to drop out. So I just keep plugging along - I am starting to work on my nutrition better. I still hope to lose a few pounds before the race - but would like to be a little heavier going into the Ironman race than I was on the 1/2 Iron. Just so that I have more fuel for the long distance. The summer is here and the sweating will be bad. Hope everyone is enjoying the year so far. Until next week - CIAO !! !